These Pork Banh Mi Meatball Sandwiches are one of the-most-delicious & memorable bites that anyone can easily whip up at home in my opinion! It’s different, delicious and takes less than 30 minutes. If you are looking for something a little different to slide in front of your family for dinner or for a weekend lunch or want to make a fun no-fuss dish for a small casual get-together. 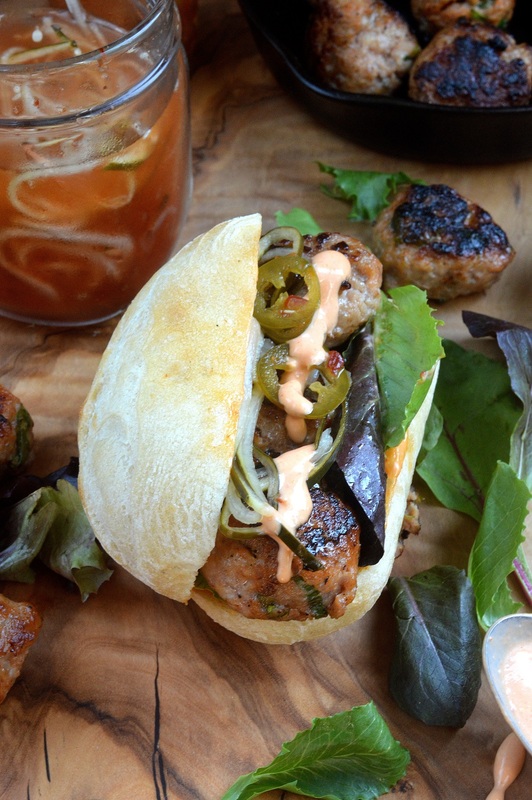 Look no further than these Pork Banh Mi Meatball Sandwiches! The spicy Sriracha Mayonnaise gives the sandwich some great flavor and I’ll bet that you will find your self whipping it up for more than just this recipe! I also topped our sandwiches with my Spicy Spiralized Pickled Cucumbers…so good & quick to make! You want to get the meatballs nice and brown and charred in spots. Over the years I had heard of people raving about Banh Mi, and I had no clue just what it was…so I looked it up on Wiki, (of course I did!!)! Which said Banh Mi was the Vietnamese name for various breads. However in the Western Hemisphere Banh Mi refers to meat-filled-breads found in Vietnamese bakeries. After meeting a new friend from Vietnam and tasting her Pho a few years ago…AND falling in love with it so much I had to whip up my own easy version, which by the way has become one of the most popular recipes here on my site…I knew I had to have a Banh Mi! So I eventually found one, devoured it and now make them at home when the mood strikes. The flavors sing in your mouth…the whole sandwich is truly delicious…and lucky for me, I live near Philly, which of course is known for its “hard” rolls. 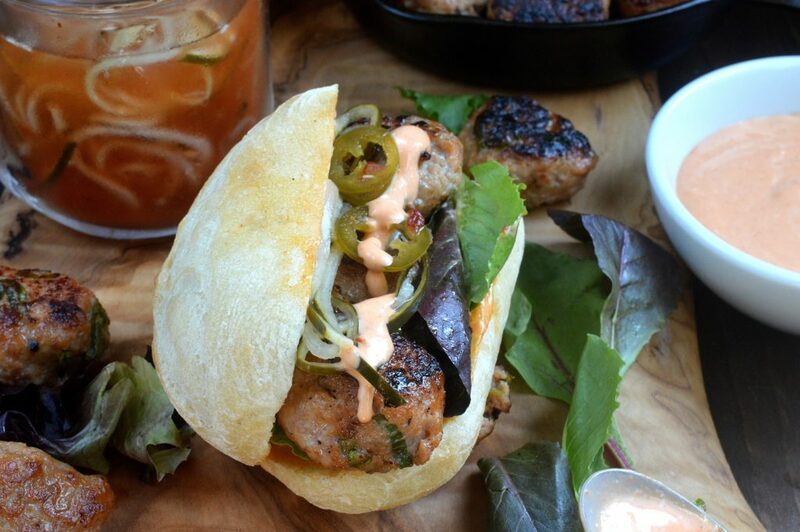 Which are perfect for making your own Pork Banh Mi Meatball Sandwiches at home! The bones of this recipe come from a site called The Woks of Life…and let me tell you…I could hang with that family…they make some a-mazing recipes…just look at their take on General Tso’s Cauliflower! Incredible…Nom!!! It’s no secret that I love meatballs! 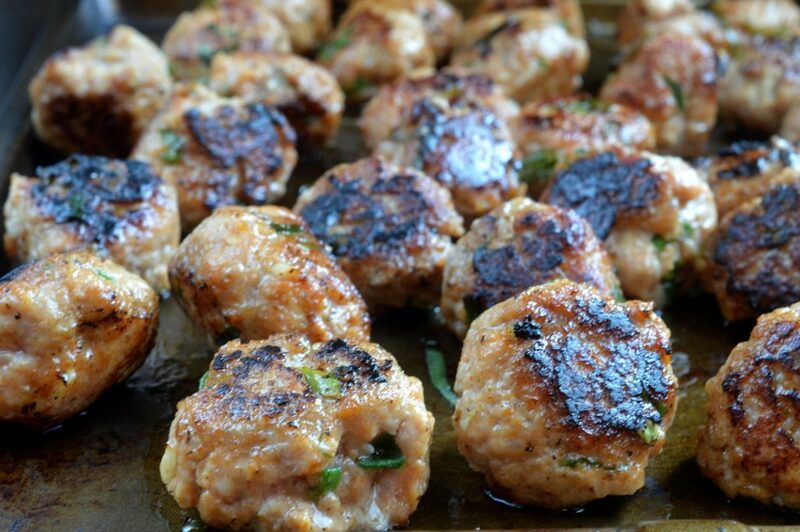 I have posted quite a few recipes for them over the years, so in addition to these Banh Mi Meatballs, how about giving these Asian Pork Meatballs, Turkey Meatballs in a Savory Broth, Chicken & Bacon Meatballs, My Daughters Meatballs, BBQ Chicken Pizza Meatballs, Asian Chicken Meatballs OR these Buffalo Chicken Meatballs a try! Phew…Told you I love a good meatball! You can now have a full week of Meatball Mania! Ha-ha You are welcome!! In a bowl, combine all meatball ingredients and mix with your hands until incorporated. Roll mixture into small meatballs (about 18) and set them aside on a tray in your refrigerator for 15 minutes or up till 3 hours, covered tightly. Mix your vinegar, sesame oil and sugar in a small mason jar or bowl. Place the cole slaw mix, cilantro & jalapeno slices in a small bowl, toss it with the dressing you made. Season with a little salt & pepper. In a frying pan, heat 2 TBS oil until hot and cook your meatballs until browned. You want them to get a little blackened and crispy...which is all a part of the sandwich experience. Once they are browned (being careful not to burn) place meatballs on a baking sheet in your oven for an additional 5 minutes or until cooked through. When ready to assemble sandwiches, split your rolls, slather on a good amount of the Sriracha Mayo (YUM), place a handful of your salad atop that, top with your meatballs and a little extra Sriracha Mayo if you wish and enjoy! You can add extra jalapenos if you like things spicy and even try my Spicy Spiralized Pickled Cucumbers as a part of it, or any pickled veggie you enjoy! You can also add extra salad greens to the sandwich. I am completely drooling. You know, I’ve never tried a banh mi…but I think I just may have to give this a shot. Looks fantastic! Thanks! These really are scrumptious, as I was typing up the post yesterday I made a mental note to get the ingredients to make then yet again, lol! My husband is a meatball freak! He’s going to love these! HE & I would get along JUST fine!! I should know better than to visit your site when I’m starving. Amazing, I’d love two please. Banh mi is amazing! As are pork meatballs. I love this!! Oh my – I love banh mi but never had one with meatballs. Yours look scrumptious! Making banh-mi rolls have been on my list to make for a long time. I really love the pork meatballs you’ve filled your rolls with. They look utter scrumptious! Ummmmmm please send some of these sandwiches my way. it looks soooooo good!